Keep the inside and outside mirrors clean and adjusted for best visibility. Be sure to adjust the mirrors before you start driving. The inside mirror has day and night positions. The night position reduces glare from headlights behind you. 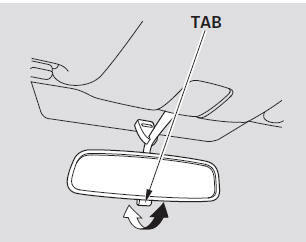 Flip the tab on the bottom edge of the mirror to select the day or night position. 2. Move the selector switch to L (driver’s side) or R (passenger’s side). 3. 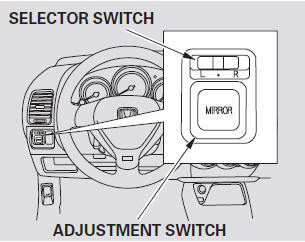 Push the appropriate edge of the adjustment switch to move the mirror right, left, up, or down. 4. When you finish, move the selector switch to the center (off) position. This turns the adjustment switch off to keep your settings.